Decided to check the latest news on Michael Schumacher's condition, and I found this article on Christian Post. 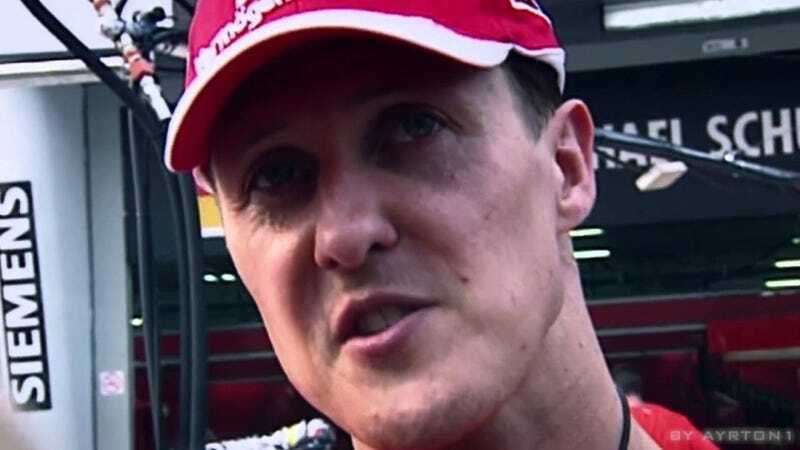 It has been a year since Michael Schumacher's skiing accident, and the F1 racer, who is said to be making a long and slow recovery, has been reported to be showing clear emotion as he continues to progress. According to various reports, the popular and much-loved diver has cried after hearing the voices of his family members, including those of his wife Corinna, son Mick and daughter Gina Maria. According to an article in the Italian newspaper Corriere della Serra, Schumacher's ability to cry and his reaction to his loved ones' voices is "valuable news" and a positive development in his recovery. "Schumi cries. And sometimes mysteriously. He cries when he hears his children, his wife's voice, his dogs. In the silence of that room, a tear runs down his thin face at a known sound," wrote Giorgio Terruzi in the Italian publication. He added, "Inside this we can find… There is life, enclosed in a drop; there is the strength of a man who is moved and that moves each of us. We have his tears, his senses exposed." Schumacher's skiing accident happened in the French Alps on Dec. 29, 2013 and left him with head injuries and brain damage. He was placed into a medically-induced coma to help stop swelling on the brain, but it took many months for him to finally emerge from the coma, and at various points it was uncertain whether he would ever wake up. However, wake up he did, and although his progress has been slow, there have reportedly been continued signs of improvement that give hope to his family and friends. Since the accident, the F1 racer's family has released very little information about his condition. Most of the recent updates about Schumacher's condition came from those who claim to be family friends and insiders in the racing world. Autosprint's editor-in-chief Alberto Sabbatini wrote that Schumacher is making some progress and that the information was provided by "those who know and see him." "The good news is that Michael is not stuck in a bed. When not undergoing physical therapy to avoid muscle atrophy, he sits in a chair in front of the windows of his villa, overlooking on one side the snowy peaks of the Swiss Alps, and on the other the shores of Lake Geneva," wrote Sabbatini.